Many Christians like myself are constantly monitoring all things relevant to the Nation of Israel while many other Christians wonder what all the fuss is about. 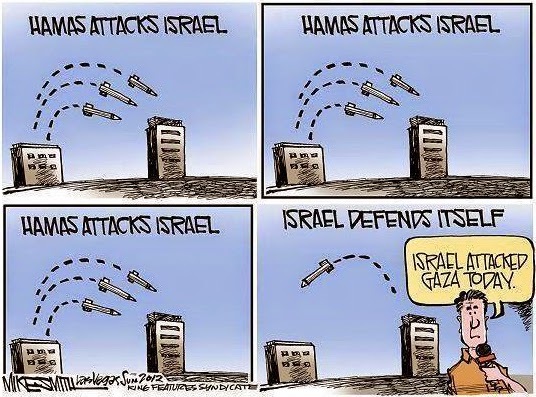 This is in part due to our main stream media's decades-old-habit of keeping Israel out of the news until she's forced into a position of having to defend herself, as the satirical cartoon on the right so adequately conveys. But I'm afraid that a lot of today's Christian apathy for the Nation of Israel is the result of a massive deficiency in Biblical literacy. Most of today's Christians get all of their spiritual input from pastors and daily devotionals. While God has certainly gifted teachers to bring us this valuable input, God meant for it to be a supplement to our daily diet, not a replacement for the daily digestion of God's Word. In terms of food, that would be like trying to stay alive with a daily vitamin pill and a small glass of milk and water. That might keep you from dieing, but I would hardly call that LIVING. By limiting our spiritual input to what we gain from today's pastors and devotionals, many Christians have come to believe that the God of The New Testament is a God who has matured from the primitive and immature God he used to be during the days of the Old Testament; as if to suggest that God somehow in the span of 4000 years finally realized that all of his wrath and judgment with commandments and rules weren't getting us anywhere. So in continuing with this line of thinking, it must have been during that 400 year gap between Malachi and Matthew that God finally developed a soft spot in his heart and decided to pay for our sins Himself so that now, we can live in an age of tolerance and understanding as God loves us unconditionally. In other words, because God's old ways in the Old Testament didn't work out for him, he changed and developed new ways codified in the New Testament so that now, we should consider the New Testament our Bible and completely ignore the Old Testament, except for historical purposes. Now folks, I have never personally heard this type of thinking taught as I've written it out in the above paragraph, but it is an accurate paraphrase of the type of thinking I've seen and heard from many Christians today when discussing the nation of Israel or discussing the Bible. While the New Testament may be a great place to start for new readers, I would never teach anyone to limit our studies to the New Testament. The Bible is ONE BOOK from Genesis to Revelation. This is an amazing and obvious discovery once the entire package has been read. As Chuck Missler has often said, "The great discovery is that the Bible is an integrated message system! It's not just 66 books penned by 40 authors over thousands of years, it's an integrated whole which bears evidence of supernatural engineering in every detail!" As I've often stated before, the English language is a vague and inconsistent language. The original Biblical language of Greek, Hebrew & Aramaic is as far above our English as English is above cave-man grunting. Today, people think of "testament" in terms of someone's testimony, someone's witness, or at best, something someone has left behind after their death in a "last will and testament". Originally, the word "testament" meant so much more. The original Greek word for Testament is "diathéké" which is also translated into the English word "covenant". The word "covenant" is probably more definitive for us today since we use the word "covenant" to define the sacred commitment between two people in marriage when we speak of the marriage covenant. A covenant is a sacred relationship, founded upon a sacred promise and bound by supernatural means. The New Covenant is founded upon John 3:16. "For God so greatly loved and dearly prized the world that He [even] gave up His only begotten (unique) Son, so that whosoever believes in (trusts in, clings to, relies on) Him shall not perish (come to destruction, be lost) but have eternal (everlasting) life." John 3:16 Amplified. God Himself is the one who is making the covenant. The covenant relationship is between God and whosoever believes in His Son Jesus to take upon their sin, trusts Him to pay for it, clings to Him because of this act and following his teachings, and relies upon Him to guarantee their passage into Heaven when they die. The promise of the covenant is salvation from death and the promise of eternal life. There are many other promises included with this covenant that are not mentioned in John 3:16 which is why there are 23 other books after "John" to explain them in detail. Some of those promises are conditional, some of them are unconditional. But the foundational promise is John 3:16 which begins a sacred relationship between God and every Christian, which is known and experienced by a Spiritual rebirth. Since the rebirth is spiritual and not physical, then races do not matter and neither do national boundaries. This is the New Covenant; i.e. The New Testament. If Spiritual rebirth in Jesus Christ is the New Covenant, then what is the old covenant? Since a covenant is a sacred relationship between two parties, founded upon a sacred promise and bound by supernatural means, then who are the two parties and what are the promises? The answer to that question goes all the way back to Genesis 12:1-3 where it all got started. God began his covenant with one man, a particular piece of real-estate and the people that would eventually be called, the children of Israel. The Old Covenant and all it's promises are about God's personal intervention throughout human history, on Israel's behalf: generation after generation, century after century, throughout all time because of that first promise made to Abraham. With those eternal promises came the prophecies of Israel's Messiah. It was foretold that He would tread down the wicked, establish an earthly Kingdom bringing in universal peace, not only between peoples and nations but even among all the animals. This coming kingdom was promised by God to King David to be a Jewish Kingdom. In striking contrast to those exciting prophecies, the Messiah was also prophesied to be rejected by Israel and executed for the sins of the world. One prophecy does not replace the other. If God is a God who keeps His promises, then BOTH prophecies must come to pass. Roughly 2000 years after God's promise to Abraham, the Messiah came to Israel and was rejected just as it was foretold. Before he was executed, Jesus prophesied that Israel would fall and the Temple in Jerusalem would be destroyed. He also said that Jerusalem would be trampled by the Gentiles until the times of the Gentiles are fulfilled. 40 years after Jesus made these statements, Jerusalem fell under Rome, the Temple was burned and dismantled literally brick by brick to retrieve all the gold. Israel fell in 70 A.D. and the children of Israel had no homeland for the next 1878 years. So many God-given promises about Israel's Messiah were still unfulfilled. What about treading down the wicked? What about the earthly Jewish Kingdom that would endure forever? What about the universal peace that would extend even to the animals? When will Israel's Messiah return to fulfill all these unfulfilled promises? It's prophesied that a future generation in Israel will one day acknowledge their offense against their Messiah and request His return. When they do, God said "I will pour upon the house of David, and upon the inhabitants of Jerusalem, the spirit of grace and of supplications: and they shall look upon me whom they have pierced, and they shall mourn for him, as one mourns for his only son." Israel's Messiah is prophesied to return to the planet earth and fulfill all those promises at the request of a future Israel, to imprison Satan in chains and establish His Kingdom. That is why Satan has done everything he possibly can to wipe out the Jews to stop that prophetic generation from being born. If there are no Jews on earth to request Jesus' return, then Jesus can't fulfill all His promises. God also promised, that he would pour the spirit of grace upon, not just the house of David but upon THE INHABITANTS OF JERUSALEM! That is why Satan has done everything he possibly can to keep Jews out of Jerusalem so that God can't fulfill that promise. But in spite of almost 2000 years of wandering without a homeland, in spite of every Satanic attempt to wipe out the Jews (including the slaughter of almost 6 million Jews under the Nazi regime), Israel was reborn on May 14, 1948. Three years after Hitler's defeat, the United Nations was formed in the hopes to prevent another dictator like Adolf Hitler from ever again rising to power. One of the first things the U.N. agreed to do was divide the middle-east into new borders giving every Arab and every Jew a place to call home and this began what has become known to this day as "The Middle East Conflict" which is summed up nicely in this short video by Dennis Prager. Nazi Germany may have been defeated, but they were merely Satan's pawns. When those pawns were defeated, Satan found new pawns. But in spite of all Satan's efforts to wipe Israel off the map, they endure to this day and will continue to endure until the return of Jesus the Messiah. The more hatred Satan conjures up to fuel attacks against the land of Israel, the more God will use their own wickedness against them to fulfill His ultimate purpose. But here's why this is important to you and me, as Bible believing Christians. The return of Israel in the 20th Century after 19 centuries of wandering, is an indication of what time it is on God's clock. The times of the Gentiles are just about up. The remnant of Jews who will acknowledge Jesus as Israel's Messiah and officially request his return, could very well be alive today. Satan hasn't had to live with the fear of that possibility for 19 centuries, but now as I write this post, he's had to live with that fear for the past 69 years. Since 1948, he's influenced attack after attack after attack against the little state of Israel and they're still there! The desperation of Satan's attempts to wipe Israel off the map is an indication to all of us, just how much little time Satan himself fears that he has left. Israel's continual existence is a testament to God's faithfulness toward keeping His promises and fulfilling His covenant with Israel. The New Covenant never replaced the Old Covenant, it came along side the Old Covenant. Our God is not a God who breaks old promises only to make new ones. Our God keeps ALL OF HIS PROMISES, old and new. The hatred that surrounds Israel is a testament to Satan's fear and desperation. As long as Israel exists, his days are numbered. Israel should matter to the Christian not only because we believe in God's promises, but because Israel is also the focus of most Biblical prophecy. Biblically illiterate Christians tend to think of prophecy as something that's confined to the book of Revelation. But the Old Covenant is saturated with prophecy concerning Israel's near future. Isaiah 46:9-10 "Remember the former things of old, for I am God and there is none else. I am God and there is none like me, declaring the end from the beginning, and from ancient times declaring the things that are not yet done, saying, 'My counsel shall stand and I will accomplish all my purpose and will do all my pleasure.'" II Timothy 3:16 "All Scripture is given by inspiration of God and is profitable for doctrine, for reproof, for correction, for instruction in righteousness." Therefore Bible Prophecy is for everyone, not just a scholar. It's for every man, woman and child to know what's about to happen. And many prophecies about the Middle East are 'stage-setting' to happen and find fulfillment in the very near future. As we observe the current landscape in the Middle East and compare it with Bible Prophecy, it would seem that a prayer of Asaph recorded in Psalm 83 could turn out to be a prophetic Psalm. Many of the Psalms are prophetic in nature and some of them aren't recognized as prophetic until the time of their fulfillment. For example, when David felt forsaken by God and prayed his famous prayer recorded in Psalm 22, he unknowingly prayed a prophetic prayer. Almost a thousand years later, Jesus quoted the very first verse of that prayer as He was being crucified. "My God, My God, why have You forsaken me?" After we read about Jesus's crucifixion and then go back to read Psalm 22, we discover that every verse of Psalm 22 could have been Jesus' silent prayer as he hung on the cross. "...they pierced my hands and my feet. I can count all of my bones: they look and stare upon me. They part my garments among them, and cast lots upon my vesture." The prophetic precision is incredible! Psalm 83 "Don't keep your silence, O God. Hold not your peace, do not be still, O God. For behold your enemies make a tumult. They that hate you have lifted up the head. They have taken crafty counsel against your people and have consulted against your hidden ones. They have said, 'Come, and let us cut them off from being a nation; that the name of Israel may be no more in remembrance.' They have consulted together with one consent: they are confederate against you: The Tents of Edom (Palestinians / Southern Jordanians), and the Ishmaelites (Saudis / Ishmael is the Arab Patriarch); of Moab (Palestinians / Central Jordanians), and the Hagarenes (Egyptians / Hagar is the Egyptian Matriarch); Gebal (Hezbollah / Northern Lebanese), and Ammon (Palestinians / Northern Jordanians), and Amalek (Arabs of the Sinai Area); the Philistines (Hamas of the Gaza Strip) with the inhabitants of Tyre (Hezbollah / Southern Lebanese); Assur (Syrians / Northern Iraqis) also is joined with them: they have helped the children of Lot (Ammon & Moab were the children of Lot, so this is referring to the Palestinians / Northern & Central Jordanians). Selah. Do unto them as unto the Midianites; as to Sisera, as to Jabin, at the brook of Kison: which perished at Endor: they became as dung for the earth. Make their nobles like Oreb, and like Zeeb: yes, all their princes as Zebah, and as Zalmunna: who said, 'Let us take to ourselves the houses of God in possession.' O my God, make them like a wheel; as the stubble before the wind, as fire burns wood, and as the flame sets the mountains on fire; so persecute them with your tempest, and make them afraid with your storm. Fill their faces with shame; that they may seek your name, O Lord. Let them be confounded and troubled for ever; yes, let them be put to shame, and perish: that men may know that you, whose name alone is Jehovah, are the most high over all the earth." So according to the prophetic implications of Psalm 83, the Arab nations surrounding Israel's immediate borders will be consulted together with one consent: to be confederate against Israel saying, 'Let us cut them off from being a nation; that the name of Israel will be remembered no more.' According to Ezekiel 25:14 and Obadiah 1:18, God will answer the prayer of Psalm 83 by empowering the Israel Defense Forces to stop the Arab confederacy. The result of this Israeli victory will extend Israel's borders far beyond what they are today. Israel will become a greater and wealthier Israel. It's that greater and wealthier Israel that will be the target of another invasion prophesied in Ezekiel 38. In Ezekiel 38, Israel is dwelling peacefully, securely and in safety. Can that be said of Israel today? No. They live in constant fear of rocket attacks from all sides. Every conference, every meeting, every summit is wrought with desperate and futile maneuvers in the hopes that something might be done to achieve peace. The wealth of Israel in Ezekiel 38 tempts Russia and Iran into devising an evil plan, to come together with Turkey, Ethiopia, Sudan, Somalia and Libya to plunder Israel and take her spoils. It's not so much the anger and hatred of an Arab confederacy that motivates the invasion of Ezekiel 38, but rather the desire for power and wealth. While Israel today certainly isn't poor, they are no where near the level of wealth, power and influence that would warrant the level of invasion that's described in Ezekiel 38. That would be like the United States, Canada, and Mexico coming together to take a little island the size of the state of New Jersey for spoil. That doesn't make any sense, unless the Israel in Ezekiel 38 is much larger and much wealthier than it is today. The Ezekiel 38 prophecy also seems to leave out Israel's present day enemies on her immediate borders. Why? Could it be, that those particular enemies are first dealt with via Psalm 83? So in combination with Psalm 83, we have many other Middle East prophecies to be fulfilled on our near horizon. According to Jeremiah 49:23-27 and Isaiah 17:1-9, God will ordain something massive to happen in Damascus, which will cause the city to become a ruinous heap and then Syria will be taken by Israel. According to Jeremiah 49:35-36, we could see a nuclear disaster of some kind take place in Iran, possibly their nuclear sites. These prophecies have been in our Bibles, in black and white for thousands of years. It has only been in recent events in the Middle East that the stage has been set for these prophecies to be fulfilled.